Powers (Cunningham) is the mastermind behind THE TOURNAMENT - an event where the best assassins in the world vie to kill each other to become the number one killer - and rake in a ten million dollar prize. Unsuspecting priest Father MacAvoy (Carlyle) becomes embroiled in all the craziness when he accidentally swallows a tracking device meant for the competitors (and will explode after 24 hours). Lai Lai Zhen (Hu) takes him under her wing in order to protect him, which will be necessary with psychos like Miles Slade (Somerhalder) on their tail. Of course, last year’s winner, Joshua Harlow (Rhames) returns - but what are his true motives? Who will be victorious in THE TOURNAMENT? The Tournament is a lot of fun and never anything less than totally entertaining. It’s professionally and competently made, which gives the action, fun, and thrills a solidity that captivates the audience. While there is a satisfying amount of very cool, comic-book violence, there’s also a nice upbeat feel and some humorous dialogue. Like The Raid (2011), it’s essentially one feature-length action scene, interspersed with short interstitial bits of exposition that move the plot along before propelling into the next action setpiece. It’s all very winning and audience pleasing. Add to that a great pace and plenty of surprises, and you can’t lose. The premise - a bunch of assassins vying to kill each other, with a likable innocent caught in the middle of it all - is a can’t-lose proposition for the audience and, thankfully - and unusually - it actually lives up to its potential. The killer plot idea is wonderfully brought to life by a colorful cast of characters and fan favorites. Robert Carlyle is endearing as MacAvoy, and we get to see “action Ving Rhames”, mixing it up with the best of them, which we loved seeing. We also loved that fan favorite Scott Adkins was involved, though, like a lot of others in the tournament, his time is necessarily limited. We understand. Kelly Hu made a top-notch “good assassin”, a perfect mirror image to Somerhalder’s “boo-hiss” evil assassin. Capping it all off is the charisma of Liam Cunningham as Powers, putting a focus to all the chaotic goings-on. Sure, we’ve seen similar plots before - even David Heavener fell victim to the “shady underground putting up cash and watching participants kill each other” situation, as has Robert Z’Dar and Jeff Wincott - in Fugitive X (1996), Dragonfight (1990), and Fatal Combat (1995), respectively - but The Tournament has so much verve it makes it all seem fresh. 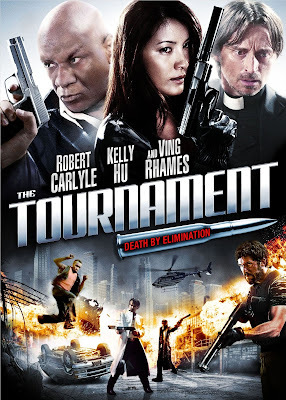 The individuals in the tournament each have clearly defined identities, as action movies used to have (i.e. Shootfighter, etc.) so it never becomes amorphous and hard to follow. Commendably, CGI seems to be kept to a minimum as well, reinforcing the old-school feel. All the elements come together nicely, from the action scenes, fights, blow-ups, slo-mo moments (we’d say “slo-moments”, but we don’t want anyone to think there are any slow moments), and it’s all pretty over the top and somewhat cartoonish, in a good way. For example, we learned if you want to get a grenade away from you, you can just shoot it with a handgun. The image of shooting a grenade with a gun pretty much sums up The Tournament - modern-day meta-violence, and slightly ridiculous - but it’s all for the fans and you gotta love it. Also check out write-ups from our buddies, DTVC, Ballistic Blood Bullets, and Cool Target! Gregori (Speakman) is one of the toughest dudes in the Russian military. Previously loyal to Mother Russia, after his brother is killed during an assault on a Spanish chemical plant, Gregori renounces it all and relocates to Sherman Oaks, California. After eleven years in the States, we see that he now has a hot wife named Katherine (Everhart), and even a precocious young daughter, Amanda (Ray) To fully complete the transformation into a U.S. citizen, he grows a beard and puts on some weight, seemingly in an attempt to strongly resemble TV’s Richard Karn. He cleverly changes his name from Gregori to Greg, but even that doesn’t stop his past from coming back. When Russian operatives enlist him to do “one last job” because “he’s the best”, “Greg” can’t resist the lure of the classic cliches, and he actually wants to get revenge for his brother, now that he’s offered a chance to kill his murderer, a guy named Mercier (Braverman). Also he gets involved in the political assassination game as it relates to a politician named Chambers (Miano). Will Greg be running away...or RUNNING RED? 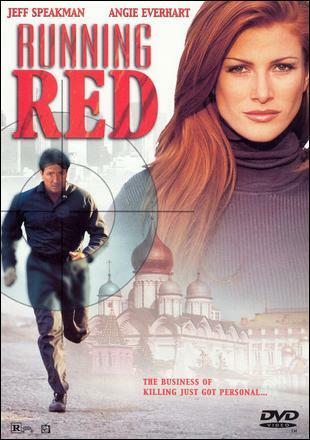 In our opinion, Running Red is the best Jeff Speakman movie. It doesn’t have any of the fat, boredom, or mind-numbing stupidity of his other works. PM is the ideal place for him, and they used him perfectly. Sure, we would have preferred more Kenpo and less gun-shooting, but in the absence of the actual Kenpo he does wear an oversized shirt that reads Kenpo Gear, and the back says “Show some respect”. Because it’s PM, it’s bright, well-lit, has a nice pace, and there are some classic blow-ups, car chases, car flips (even a double-car flip), gunfights, and well-choreographed action. It’s all very professional and works well. Director Jacobs has been hit or miss for us in the past; we loved A Dangerous Place (1995), but thought Freedom Strike (1998) was lame. Running Red puts another one in the win column for Mr. Jacobs. The title could refer to the fact that Greg is running from his red past, or the running of blood, or be a subtle reference to Everhart’s hair. It’s also the color of his daughter’s Game Boy Color. Coincidence? Part of the plot even involves Greg’s wife wanting to drag him to her high school reunion because she “wants to show him off to her friends”. Presumably she’s going to tell them she’s married to Richard Karn. But another possible title could be “Running Red Heat”, because, like Rangers (2000), the bus chase from Red Heat (1988) is interpolated into the movie. If Running Red and Rangers can afford this footage, it must be going at fire sale prices. But didn’t PM realize that action fans would likely recognize what they saw? Maybe they were banking on the fact that the whole outing feels a bit...familiar. But still, it’s Speakman at his best. The guy who plays Mercier looks a lot like Joe Mantegna, fan-favorite Robert Miano has a small but noteworthy role (was he contractually obligated to be in every PM movie? ), and instead of a drug deal gone wrong, there’s an arms deal gone wrong. Instead of a wacky taxi driver, there’s a wacky exterminator. The daughter is cute in the classic Sarah Dampf style (bet you didn’t know there was a classic Sarah Dampf style), and she loves soda and hamburgers. She also eats a cereal called Crispy Rounds. If action heroes didn’t have daughters, what would get them up in the morning? 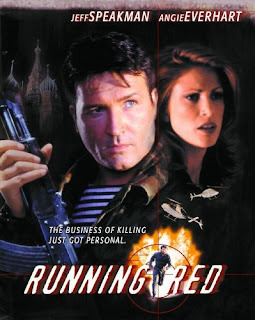 Running Red is the perfect place to start if you’ve never seen a Jeff Speakman movie. It might be all downhill from here (though his other films do have some of their own individual merits, to be fair) - but Running Red is a winner, and quite possibly the best DTV actioner of 1999.